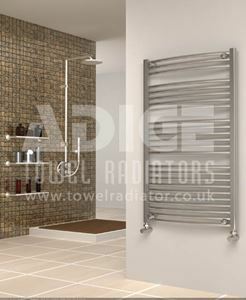 700mm wide and 1150mm high chrome curved heated towel rail with 538 Watt - 1834 BTU/h @ Delta 50. 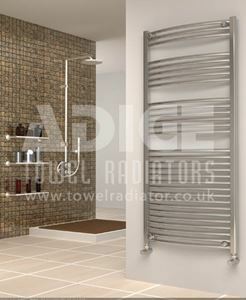 700mm wide and 1150mm high chrome flat heated towel rail with 535 Watt - 1825 BTU/h @ Delta 50. 700mm wide and 1150mm high white flat heated towel rail with 677 Watt - 2311 BTU/h @ Delta 50. 700mm wide and 1500mm high chrome curved heated towel rail with 678 Watt - 2315 BTU/h @ Delta 50. 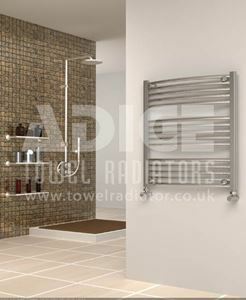 700mm wide and 1500mm high chrome flat heated towel rail with 675 Watt - 2303 BTU/h @ Delta 50. 700mm wide and 1500mm high white flat heated towel rail with 855 Watt - 2916 BTU/h @ Delta 50. 700mm wide and 1750mm high chrome curved heated towel rail with 791 Watt - 2700 BTU/h @ Delta 50. 700mm wide and 1750mm high chrome flat heated towel rail with 788 Watt - 2687 BTU/h @ Delta 50. 700mm wide and 1750mm high white flat heated towel rail with 997 Watt - 3402 BTU/h @ Delta 50. 700mm wide and 750mm high chrome curved heated towel rail with 339 Watt - 1157 BTU/h @ Delta 50. 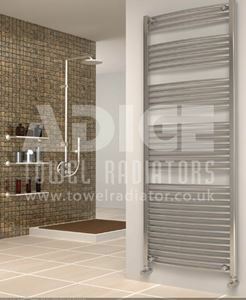 700mm wide and 750mm high chrome flat heated towel rail with 338 Watt - 1152 BTU/h @ Delta 50. Availability: Out of stock - on backorder to be dispatched on or after 02 May 2019. 700mm wide and 750mm high white flat heated towel rail with 427 Watt - 1458 BTU/h @ Delta 50.